The Education Minister says schools should teach less religion and more reading. In my humble opinion, schools—even primary schools—should teach more mathematics too. I don’t mean sums, I mean mathematics. Children will become familiar with logic, conceptual thinking, problem solving and truth. Nothing is truer than mathematics. 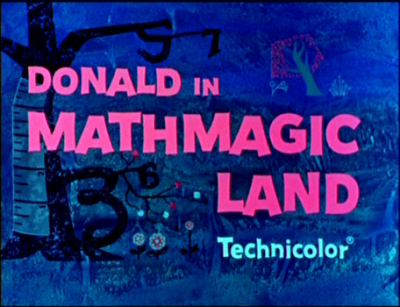 Mathematics leads to architecture, music and biology, as Donald Duck found out. Why should schools teach religion at all? You could say it inculcates tribal attitudes and behaviour that can be profoundly unChristian—indeed, inhuman. It encourages parents to think that since school does it, they don’t need to, either at home or by church commitment. It encourages a view of God as a cross between a sky pixie and an irascible parent who needs to be placated and evaded. It’s used to tell children that they should be nice, clean, tidy, adhere to notions of respectability and generally do what adults tell them. It can lead to a kind-of spiritual infantilization and emasculation that soon fails them. What should I be saying at school Assemblies? Should I teach the doctrine of the Holy Undivided and Indivisible Trinity (mathematical concepts of simplicity there), or the difference between substance and essence (chemistry here)? maybe I should be exploring with them the feminine part of the Divine, Sofia, Mary redemptrix (plenty biology there). What about how Greek ideas and fairy tales shaped the Gospels? What I do try to say is that the Divine light is in ‘here’ in everyone, that ‘we’ is more important than ‘me’ (ants), that we light the way for others when we let the light shine out of ourselves (fireflies), and that we all benefit from a bit of quietness (dormancy and metamorphosis). And also, of course, that whereas human team captains can’t avoid being swayed by personal considerations, there is one captain who shows us the way. I try to explore with them what they think God-ness might be like. I ask them to consider when being ‘nice’ is inappropriate and when they should fight for justice. I doubt that’s what parents or teachers want. But I plod on trying, for the sake of the staff, not to let the pupils see how much I squirm with embarrassment at some of the words of the silly songs. After the example of an esteemed colleague, I’ve started reading stories. Oscar Wilde’s The Selfish Giant was a smasher.